The "greatest driving road in the world" is paid homage by the brand new 2018 Alfa Romeo Stelvio Quadrifoglio. The Stelvio Pass, located in the Italian Alps, was the inspiration behind this sleek, stylish SUV, which mimics the graceful S-curves of the natural wonder. As the top model of the Alfa Romeo Stelvio, the Quadrifoglio highlights the pinnacle of Alfa Romeo's 100+ years of high-quality Italian craftsmanship. If you want the most luxurious vehicle Alfa Romeo can provide, then you need to read on below and learn more about the 2018 Alfa Romeo Stelvio Quadrifoglio! The 2018 Alfa Romeo Stelvio Quadrifoglio features the most powerful production engine Alfa Romeo has ever made, which provides best-in class horsepower. The all-aluminum direct-injection 2.9-liter twin-turbo V6 engine features a compact 90-degree layout, capable of providing a flat torque curve of 443 pound-feet of peak torque and a class-leading 505 horsepower. 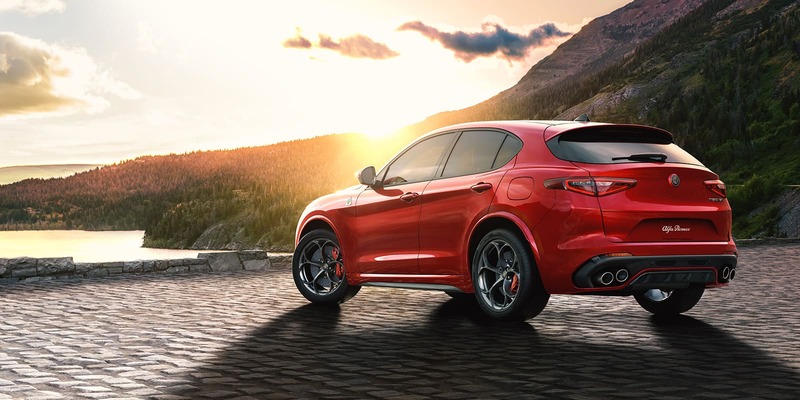 With top speeds of 177 miles-per-hour, the 2018 Alfa Romeo Stelvio Quadrifoglio features an eight-speed automatic transmission and the intelligent Q4 all-wheel-drive system, allowing it to reach 0-60 mph in only 3.9 seconds (estimated). Unique performance features in the 2018 Alfa Romeo Stelvio Quadrifoglio include high-performance Brembo brakes, an adjustable performance suspension, a torque vectoring differential, 20-inch aluminum wheels and the Alfa DNA Pro system. The Alfa DNA Pro system features four selectable modes, including a Race mode, to provide peak performance when you hit the gas. The 2018 Alfa Romeo Stelvio Quadrifoglio has a nearly perfect 50/50 weight distribution and steering column-mounted aluminum paddle shifters, in addition to a cylinder deactivation system that improves fuel-efficiency. The exceptional 2018 Alfa Romeo Stelvio Quadrifoglio is the highest performing SUV available with this level of craftsmanship, design and power! High-performance leather upholstery is standard in the luxurious 2018 Alfa Romeo Stelvio Quadrifoglio, in addition to many other features. Sparco carbon fiber shell racing seats with aggressive bolstering provide ultra-lightweight comfort and include 14-way power adjustments. The Formula One-inspired steering wheel features the aluminum column-mounted paddle shifters mentioned above and a red push-button starter. 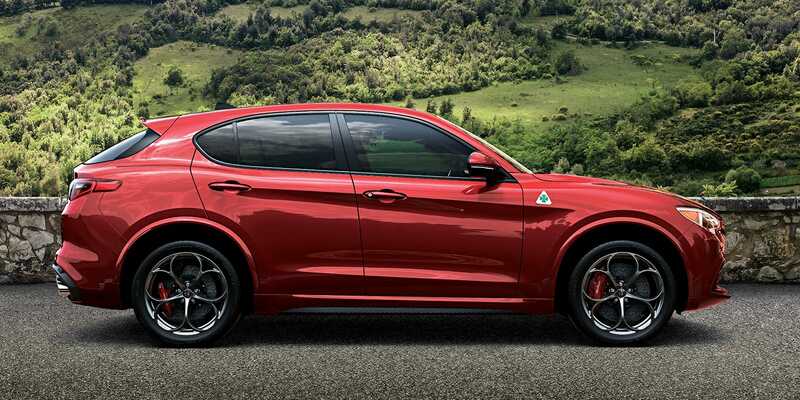 The 2018 Alfa Romeo Stelvio Quadrifoglio is offered in 13 gorgeous exterior colors and a plethora of interior trim colors and accent options, so you can craft your luxury SUV to meet your exact desires. If you want an SUV that turns heads with its stylish, performance-based power and Italian-good-looks, then you need the 2018 Alfa Romeo Stelvio Quadrifoglio. Are there any other trim levels offered for the 2018 Alfa Romeo Stelvio? Yes there are! You can read our in-depth reviews of the 2018 Alfa Romeo Stelvio and 2018 Alfa Romeo Stelvio Ti by following the link! Learn More About the 2018 Alfa Romeo Stelvio and 2018 Alfa Romeo Stelvio Ti! How fast can the 2018 Alfa Romeo Stelvio Quadrifoglio go? The 2018 Alfa Romeo Stelvio Quadrifoglio has a top speed of 177 mph! Can you help me value my vehicle for a trade? Absolutely! We can help you appraise your trade-in vehicle online! Fill out our form before you come in so you know exactly what your current vehicle is worth! Fill Out Our Trade-In Appraisal Form! The 2018 Alfa Romeo Stelvio Quadrifoglio provides exceptional innovations for safety and security, making this high-performing SUV an even more attractive prospect. The intelligent Q4 system provides enhanced traction for all-season driving, due to the 2018 Alfa Romeo Stelvio Quadrifoglio's ability to direct up to 60% of the engine's torque to the front wheels. Other safety features available for the 2018 Alfa Romeo Stelvio Quadrifoglio include lane departure warnings, adaptive cruise control systems, full-speed forward collision warnings, autonomous braking, blind-spot monitoring systems, front-and rear-parking sensors and more. Additionally, the 2018 Alfa Romeo Stelvio Quadrifoglio features a full suite of advanced multistage airbags, all positioned to cushion the cabin in the case of collision. The 2018 Alfa Romeo Stelvio Quadrifoglio is an exceptional SUV you'll love driving! Stop by Alfa Romeo of Larchmont to test drive the 2018 Alfa Romeo Stelvio Quadrifoglio today!